For local ranking power, citations are kind of a big deal. These little profiles, each containing your Name, Address and Phone number (NAP) have a powerful cumulative effect on your rankings. When they’re correct, they can make you the king of the pack. The local pack. Citations matter for ranking in local search but, what about incorrect or inconsistent citations? What happens when the name is wrong, or the address and phone numbers are out-of-date? That’s when you see the reverse effect. Your rankings plunge as you’re forced to compete against your own listings. Your sales will soon follow if your customers are being sent to the wrong locations or calling the wrong numbers. With hundreds of citation sites out there, a proper citation cleanup feels like the world’s most frustrating game of whack-a-mole. We’re here to help do the heavy lifting with a complete citation audit for just $7. NAP Variations: We’ll start by finding the existing variations (previous and current) of your name, address and phone number. Both manual and automatic searches are used to review as many citations as possible. Existing Correct Citations: We’ll be able to tell you what you’re doing right and you’ll get a sourced list of places where you can find your correct citations. A catalog if you will. What you should have had from the start. Existing Incorrect Citations: Here’s what you came here for. We’ll track down your bad citations, and tell you where they went wrong. Even if you don’t need us to help you fix them, you’ll know where to find them. Aggregator Checks: You may have paid aggregators to spread your citations around. These tools submit to a large number of directories. When you have a lot of bad citations around, it can usually be traced back to one of these bad boys. We’ll tell you who needs your attention. Data Aggregators Citations: If you’re subscribed to Localeze, Yext or other common directory sites, we collect them together so you can update all of your information just by logging in. 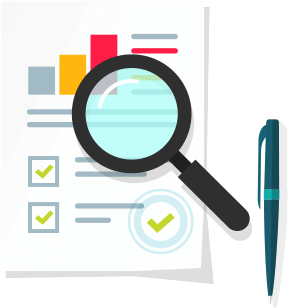 Report Creation & Digital Delivery: After scouring the web for incorrect citations our team will compile a custom report that lists the good, bad and ugly citation errors. You’ll receive an email from us with a spreadsheet that details exactly where to focus your energy to boost your local rankings, be it further citation building or a cleanup campaign.